The video for this Red Nose Day chart-topper makes the most of a powerhouse combination: celebrities and cute babies. 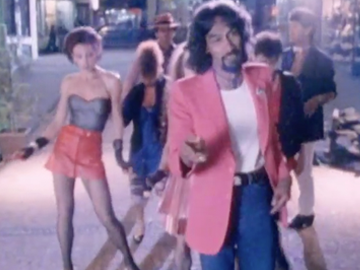 Although lead singer Hammond Gamble gets his share of screen time, the result is largely devoted to close-ups of perhaps the biggest pile-up of famous Kiwis to cram into a single music video. The faces include appearances early on by Simone Kessell, Ilona Rodgers, and Aussie actor Mark Raffety — plus The Wizard, sports legends Grant Fox, John Kirwan and Jeremy Coney, newsreaders Judy Bailey and Anita McNaught, and singers Tina Cross and Suzanne Lynch. Sonny Day was a working musician from the late 50s to the early 90s, but recorded infrequently. 'Savin' Up', his first solo single, was a soulful cover of a song Bruce Springsteen gifted to his sax player Clarence Clemons — and an appropriate counterpoint to the glitz of 80s materialism. The video, shot in Auckland's Vulcan Lane plus the legendary Birdcage bar, has Sonny in his element, while performing with a band that includes Neil Edwards (ex-Underdogs), Tama Renata (ex-Herbs) and backing vocalists Annie Crummer, Beaver and Josie Rika.